Macmillan of Canada. Hardcover. GOOD. Spine creases, wear to binding and pages from reading. May contain limited notes, underlining or highlighting that does affect the text. Possible ex library copy, thatâll have the markings and stickers associated from the library. Accessories such as CD, codes, toys, may not be included. Macmillan of Canada, 1987. Hardcover. Very Good. Disclaimer:A copy that has been read, but remains in excellent condition. Pages are intact and are not marred by notes or highlighting, but may contain a neat previous owner name. The spine remains undamaged. 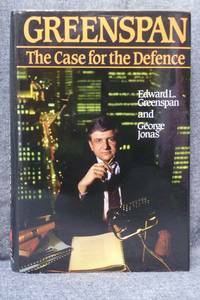 At ThriftBooks, our motto is: Read More, Spend Less.Dust jacket quality is not guaranteed. Rexdale, Ontario, Canada: Macmillan of Canada, 1987. A very good to fine grey hardcover in a fine dust jacket. 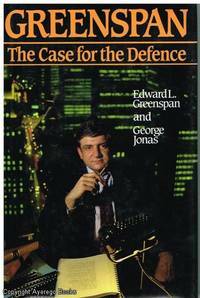 Copyright 1987..
Jonas, George; Greenspan, Edward L.
Rexdale, Ontario, Canada: Macmillan of Canada, 1987. Book. Good. Hardbound. Signed by Author(s). No Additional Printings Stated. 9" by 6". Dark grey binding with silver title, sturdy, 468 pages, inscribed by author to former owner on first end page, mild edge wear, page edges are lightly soiled; jacket is clean, mild edge wear and rubbed. Macmillan Of Canada, 1987. Hardcover. Very Good +/very good +. Rexdale, Ontario, Canada: Macmillan of Canada, 1987. Book. Very Good+. Hardcover. Signed by Author(s). Canadian First. 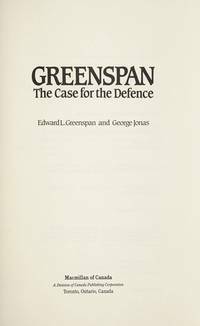 Signed by Edward L. Greenspan on the title page with no inscription; a solid, clean copy in collectable condition; dust jacket is protected by a Brodart sleeve..
Rexdale, Ontario, Canada: Macmillan of Canada. Near Fine in Near Fine dust jacket. 1987. First Edition. Hardcover. 077159495X . A Good Read ships from Toronto and Niagara Falls, NY - customers outside of North America please allow two to three weeks for delivery. Minor rubbing to d/j and a few creases on edges. Flat-signed by author on title page. ; 8vo - over 7¾" - 9¾" tall; Signed by Author . Toronto: MacMillan of Canada, 1987. 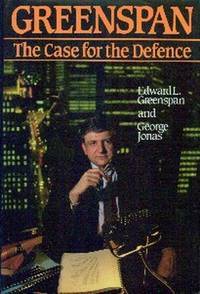 A stimulating account of a twenty-year period in the life and times of one of the country's most outstanding criminal lawyers. 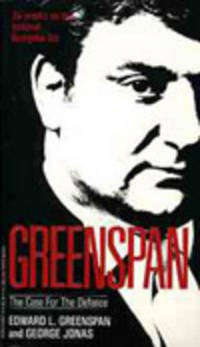 Central to the book are Greenspan's own cases, ranging from dramatic murder trials to those that few people have ever heard about. Woven into the narrative are Greenspan's comments on legal, social or jurisprudential points such as police powers, parole and plea bargaining. Grey boards with silver print to spine. Slight spine lean, mild bruising to corners. No ownership markings. Photo dust jacket. Jacket photo by Jim Allen.. First Edition. Hard Cover. Very Good/Near Fine. Macmillan of Canada. Hardcover. 077159495X Like New Condition. . Fine.